The authors consulted many more books than are listed; only the most generally useful are given here. While there are many history books on 17th-century France, you can find most of what you need to know from a more user-friendly general overview of Early Modern European History, such as Klose's Modern Western Civilization, Book I. A readable and gossipy approach to the court of Louis XIII and Cardinal Richelieu (with lots of pictures) can be found in Auchinloss' Richelieu, listed below. For an incredibly detailed and complete analysis of nearly every aspect of European society, try Braudel's three-volume Civilization and Capitalism, 15th-18th Century. Do you want to know how many hours a 17th-century peasant had to work to buy a loaf of bread? It's in there. Any good historical atlas, or even an atlas of the modern world, will be a help in following some of the history. A picture is worth the proverbial thousand words when trying to evoke the mood of an earlier century. The following books are highly recommended for GM's and players alike. There are also many "genre" painters of the 17th century. This term refers to artists who portray scenes from daily life, rather than mythological scenes or portraits of the nobility. This can be very useful for seeing what the house the PCs are hiding in might look like, etc. Look in art anthologies for the works of Vermeer, Steen, Von Ostade, Van der Ulft, Greuz, Chardin, Villegas, Meissonier, Lorraine, Vibert, Le Nain, Le Valentin, and others listed as being genre painters. Not all of their works will be useful (genre painting didn't pay as well as portraits of the nobility), but there will be enough to give you a good idea of the era. The following two books are also highly recommended. The artists were not alive in the 17th century, so the historical accuracy of their work is questionable. 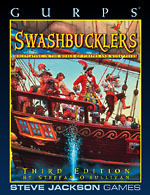 There is no questioning the swashbuckling spirit that runs through their wonderful paintings and drawings. A moving picture is worth a thousand moving words. Most of these are available at video rental stores; others show at colleges and Film Festivals. 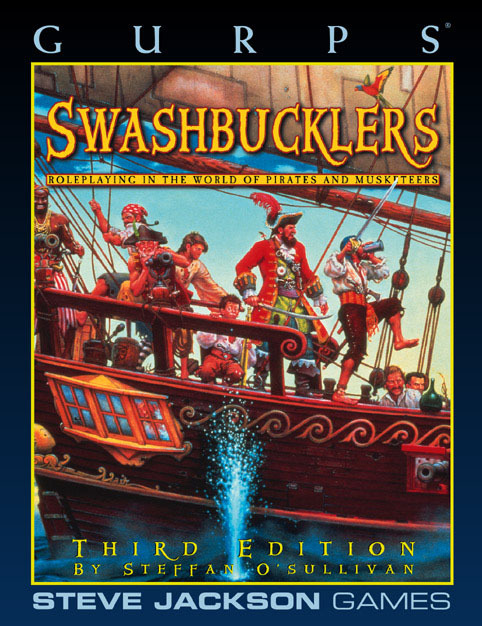 Other swashbuckling titles are also available. Tastes vary widely, so these are not rated beyond an asterisk (*) to denote an author's or editor's choice. Try gaming some of these flashy techniques! Those lucky enough to live near a major port should be able to find an old sailing ship to visit. This is an invaluable experience, especially if you play the game a bit first, then go with questions and situations in mind to explore. A friendly chat with the curator of the ship will be worthwhile – these people usually love their jobs. Most of the sailing ships that are preserved in this country are of the 19th or 20th century, but there are a few older ones, and a few replicas. Even a large 20th-century sailing ship will give you a good idea of what it was like. The major difference will be size; 17th-century ships are usually much smaller than their "descendants." If you live in New England, there are many fine ships to visit. The U.S.S. Constitution – "Old Ironsides" – which dates back to the 1790s, is berthed in the Boston area. It would be huge by 17th-century standards, but is still well worth the trip – and it's free! The Boston Tea Party Ship is from the early 20th century, but is a fairly accurate representation of an older ship. This is very close to the average merchant ship of the swashbuckling era. The Mayflower II, in Plymouth, MA, is a very good guess at a replica of an early 17th-century ship – even Drake's ship wouldn't be too different. Also in New England is the largest model ship in the world, the half-sized whaler Lagoda in New Bedford, MA. Mystic Seaport in Connecticut has a number of good ships to explore. Newport, RI, has an excellent reproduction of a Revolutionary War privateer, the Providence. New York City has a number of old ships, but the best is up river in Poughkeepsie, the sloop Clearwater. Philadelphia has the Gazela; Baltimore has the U.S.S. Constellation and the Pride of Baltimore; Alexandria, VA, has the Alexandria, St. Mary's City in Maryland has the beautifully recreated Maryland Dove. Jamestown, VA, is the home of three fine reproductions. The Elizabeth II is in North Carolina; the Adventure is in South Carolina; a replica of the HMS Bounty, made for MGM's movie, was in St. Petersburg, FL until it sank in 2012, a casualty of Hurricane Sandy. In the Great Lakes region, the Sea Lion is in Mayville, NY; the Niagara is in Erie, PA; and the Welcome is in Mackinaw City, MI. The West Coast can boast the C.A. Thayer in San Francisco, a beautifully preserved lumber ship of the mid-19th century; the Star of India is in San Diego. Canada and Europe have many old-time ships preserved and reproduced, also. Too nice to ignore is the reproduction of Jacques Cartier's ship in Quebec City. A guide book will list others. In addition, there are numerous maritime museums with pictures, models, books, plans, partial reproductions and thousands of pieces of hardware, from cannons to spars to sextants. Here is a unique group for roleplayers and history buffs: the Pirate Brethren (formerly the Brethren of the Bay). Currently active in the Mid-Atlantic region (but looking to expand), the Brethren share information about 18th-century piracy through re-enactments and visits to ships. Some of the current members are GURPS roleplayers! Their website can be found here.